Major League Soccer and the American sports community lost a true treasure on December 13, 2006 when MLS founding investor, and investor-operator of the Columbus Crew peacefully passed away at Presbyterian Hospital in Dallas, Texas at the age of 74. Hunt was originally diagnosed with prostate cancer in 1998 and quietly underwent many treatments and surgeries over the past eight years. He maintained his active schedule until entering the hospital for the final time on November 22. He was surrounded by his wife, Norma and their four children, Lamar, Jr., Sharron Munson, Clark and Daniel. He was also the proud grandfather of 14 grandchildren. Recognized as one of the greatest sports visionaries in American history, Hunt pioneered professional soccer in the United States. He was bitten by the soccer bug during the 1966 FIFA World Cup, and attended every ensuing World Cup, with the exception of 1978 and 2006. In 2002, he witnessed at least part of a tournament match in each of the 20 venues spread across the co-hosting countries of South Korea and Japan. Hunt helped make pro football history in 1960 by founding and organizing the American Football League. Long known for his role in the development of football as founder of the Kansas City Chiefs, Hunt's contributions to pro soccer have also had a major impact on sports in the United States. In 1967, Hunt became an original investor in the Dallas Tornado Soccer Club, in what was known initially as the United Soccer Association and then the North American Soccer League in 1968. In 1971, Hunt won his first professional soccer championship when the Tornado defeated the Atlanta Chiefs two games to one. A model franchise during its 14 years, the organization and its legacy of soccer disciples was an early catalyst in the development of the game, placing North Texas at the cutting edge of the American youth soccer market. The Hunt family once again stepped to the forefront of U.S. soccer in 1996 by becoming a charter investor in Major League Soccer. Lamar and son Clark as Major League Soccer was created with a unique single-entity operating structure, in which investors own an interest in the league in addition to individual teams. The Hunts were the original investor-operators of the charter teams from Columbus (Ohio) and Kansas City. Hunt made his greatest contribution to soccer in this country in 1998-99, when he made pro soccer history by funding the construction of the first soccer-specific stadium in the United States as the Columbus Crew opened their revolutionary facility. 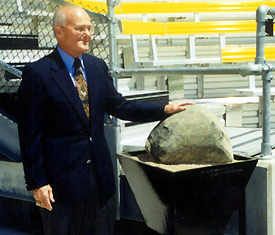 The stadium broke ground on Aug. 14, 1998, and was finished in nine months and one day. Columbus Crew Stadium opened on May 15, 1999 and a sold-out, overflow crowd of 24,741 in the 22,555-seat venue watch the Crew defeat the New England Revolution 2-0. The 1999 MLS season proved to be a historic one for Hunt, as he was awarded the National Soccer Hall of Fame Medal of Honor -- the second to receive the medal reserved for extraordinary individuals whose positive contributions to soccer at the national level affected the course of soccer history in the United States. That year, he also saw the U.S. Open Cup Tournament renamed in his honor. The Lamar Hunt U.S. Open Cup, recognized as U.S. Soccer's National Championship, is an annual competition open to all amateur and professional soccer teams affiliated with U.S. Soccer. Dating back to 1914, the single-elimination tournament is the oldest annual team tournament in U.S. sports history. The Kansas City Wizards became the second Hunt soccer team to capture a crown, winning the 2000 MLS Cup over the Chicago Fire 1-0 in Washington D.C., on Oct. 15, 2000. A year later, it was Columbus that added a trophy to the case. On Oct. 24, 2002, the Crew won the tournament that bears his name -the Lamar Hunt U.S. Open Cup - in the stadium that he built - Crew Stadium - by defeating the Los Angeles Galaxy 1-0. Entering the 2006 season, Hunt-founded Crew Stadium and Pizza Hut Park were two of the three operating stadiums in Major League Soccer built specifically for soccer. The stadiums have hosted numerous high-profile events, including many memorable soccer games. The U.S. Men's National Team has posted a 4-0-3 record at Crew Stadium. Behind raucous pro-American crowds, the U.S. team earned two World Cup Qualifying victories over rival Mexico, including a 2-0 won on Sept. 3, 2005, which qualified the U.S. for the 2006 World Cup. Crew Stadium also played host to the 2000 MLS All-Star Game and the 2001 MLS Cup. Pizza Hut Park has also hosted the U.S. National Team, as well as those of Mexico, Ghana and Guatemala. The Park was a host venue for the 2006 InterLiga tournament featuring the top Mexican First Division clubs, and in November 2006 was chosen to once again be a venue for InterLiga 2007. The stadium has also been the site of the past two MLS Cup Championship matches, including the 2006 title game on Nov.12 which saw Houston defeat New England in penalty kicks before an overflow crowd of 22,427 - the largest soccer crowd in the short history of the facility. At the 2004 MLS Cup, Hunt was presented the Commissioner's Award by MLS Commissioner Don Garber for being one of the league's founding fathers as well as a man who has championed soccer in the United States for nearly 40 years. As far back as 1982, Hunt was honored for his efforts to help establish pro soccer in America by being inducted into the U.S. Soccer Hall of Fame in Oneonta, N.Y. Hunt has also been inducted into both, the Pro Football Hall of Fame and the International Tennis Hall of Fame, as well as the sports halls of fame of both Missouri and Texas. In 2005, the U.S. Soccer Foundation, the major charitable arm of soccer in the United States, presented Hunt with the Foundation's Lifetime Achievement Award. For as much as soccer was a passion of his, his Kansas City Chiefs always remained one of his most prized sporting entities. His passion for athletics encompassed more than just the game of soccer and football. Appropriately nicknamed "Games" during his childhood, Hunt's love of sports was his true passion, an enthusiasm which led to his involvement in six different professional sports leagues and seven sports franchises. In addition to his formative role in the creation of the NASL, the AFL, and MLS, Hunt was also involved in the development of,World Championship Tennis. WCT changed the landscape of professional tennis and Hunt's efforts were commemorated in 1993 with his induction into the International Tennis Hall of Fame. Hunt was born on August 2, 1932 in El Dorado, Arkansas and graduated from SMU with a B.S. in Geology in '56. While at SMU, he was a three-year reserve end on the Varsity Football Team. Hunt was an avid supporter of his alma mater and was an annual fixture at the Cotton Bowl. He and his wife Norma were also involved in numerous philanthropic and civic efforts in Dallas, across the state of Texas and in the Kansas City community.